The Global Volcanism Program has no activity reports for Narage. The Global Volcanism Program has no Weekly Reports available for Narage. The Global Volcanism Program has no Bulletin Reports available for Narage. 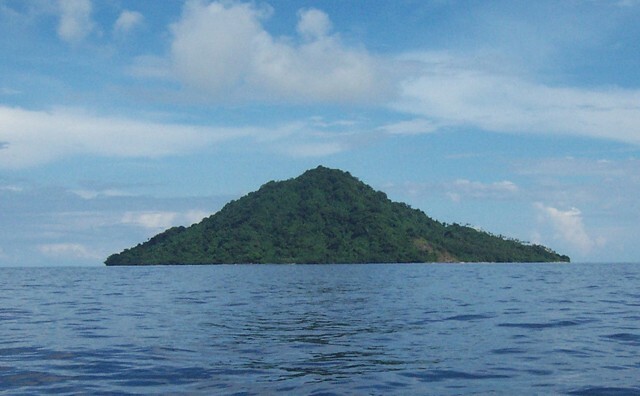 The small forested island of Narage is the northernmost of the Witu (or Vitu) Islands, which lie north of western New Britain. Narage is the summit of a Pleistocene stratovolcano that displays strong thermal activity, and was included in the Catalog of Active Volcanoes of the World (Fisher, 1957) based on its geothermal activity. Boiling springs and a geyser are found along the SE and SW coasts; in 1863 a geyser 45 m high was observed at a sandbank 8 km offshore. A fringing reef, prominent on satellite imagery, encircles the island at a distance of 200 m to 400 m and encloses a narrow lagoon. Fisher N H, 1957. Melanesia. Catalog of Active Volcanoes of the World and Solfatara Fields, Rome: IAVCEI, 5: 1-105. Johnson R W, 1990. (pers. comm.). Johnson R W, Arculus R J, 1978. Volcanic rocks of the Witu Islands, Papua New Guinea: the origin of magmas above the deepest part of the New Britain Benioff zone. Bull Volcanol, 41: 609-655. Johnson R W, Blake D H, 1972. The Cape Hoskins area, southern Willaumez Peninsula, the Witu Islands, and associated volcanic centres, New Britain: volcanic geology and petrology. Aust Bur Min Resour Geol Geophys Rec, 1972/133: 1-102. Johnson R W, Everingham I B, Cooke R J S, 1981. Submarine volcanic eruptions in Papua New Guinea: 1878 activity of Vulcan (Rabaul) and other examples. Geol Surv Papua New Guinea Mem, 10: 167-180. Sapper K, 1917. Katalog der Geschichtlichen Vulkanausbruche. Strasbourg: Karl J Trubner, 358 p.
The Global Volcanism Program is not aware of any Holocene eruptions from Narage. If this volcano has had large eruptions (VEI >= 4) prior to 10,000 years ago, information might be found on the Narage page in the LaMEVE (Large Magnitude Explosive Volcanic Eruptions) database, a part of the Volcano Global Risk Identification and Analysis Project (VOGRIPA). There is no Deformation History data available for Narage. There is no Emissions History data available for Narage. The Global Volcanism Program has no photographs available for Narage. The following 1 samples associated with this volcano can be found in the Smithsonian's NMNH Department of Mineral Sciences collections, and may be availble for research (contact the Rock and Ore Collections Manager). Catalog number links will open a window with more information. Large Eruptions of Narage Information about large Quaternary eruptions (VEI >= 4) is cataloged in the Large Magnitude Explosive Volcanic Eruptions (LaMEVE) database of the Volcano Global Risk Identification and Analysis Project (VOGRIPA).